Gloves, Flying, Type H, Electrically Heated. Stores reference 22c/1033/5. Size medium. 24 volt. 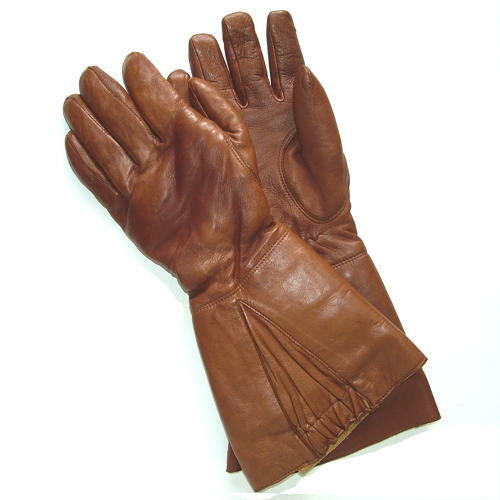 Beautifully soft chestnut brown leather gauntlets. Mid forearm length with a gussetted cuff. Lined with attached, fleece lined brown/black rayon gloves with integral wiring and twin press stud connectors. Intended for use with other type-H heated/wired clothing. The inner gloves have '24 volt' and war department broad arrow marked labels. The leather is in lovely condtion bar minor marking and a few broken stitches on one of the cuff flaps (see photo). Externally they are very well colour matched, inside one liner is black, the other brown. A.I.D marked inside the cuff and with excellent clear labels in the inner gloves. An excellent pair that have clearly seen very little use. Stock code GA17934.